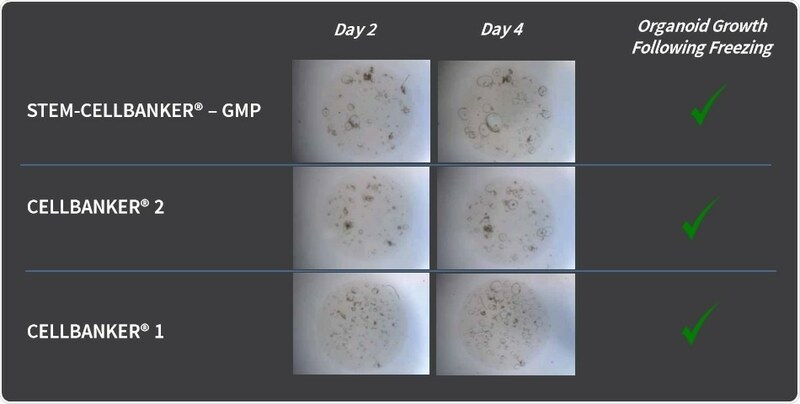 Data is presented that clearly shows that liver organoids recovered and grew well in STEM-CELLBANKER®–GMP, CELLBANKER® 1 and CELLBANKER® 2 freezing media after being thawed out after 2 days and 4-days cryopreservation. The protocol took only 25 minutes to cryopreserve the organoids and 25 minutes to thaw them out. The cryopreservation techniques presented in this study will allow organoid models to be archived for long-term storage within “living biobanks”. Organoids are organ-like structures that can be formed by 3D cell culture and differentiation of stem cells or organ progenitors; and are capable of recapitulating aspects of organ function in vitro. Research & therapeutic potential of organoids includes: organogenesis models, drug testing, tumor, disease and infection models, toxicity screening, personalized medicine and regenerative medicine / organ replacement. Supplied as a ready-to-use formulation, CELLBANKER® cryopreservation media are chemically defined freezing solutions optimized to ensure stable long-term storage of cells. These easy-to-use cell freezing media offer unmatched high cell viability in serum and serum-free formulations to successfully cryopreserve the most sensitive and valuable mammalian cells. CELLBANKER® cryopreservation media are widely proven to significantly increase cell viability while maintaining cell pluripotency, normal karyotype and proliferation ability following resuscitation from cryopreservation, even after extended long-term storage. Independent research has demonstrated that hESC, MSCs and iPSCs cryopreserved with CELLBANKER® cryopreservation media produce significantly higher cell viability (>90%) compared with conventional freezing medium, while retaining cell pluripotency, normal karyotype and proliferation ability. AMS Biotechnology (AMSBIO) is recognised today as a leading company contributing to the acceleration of discovery through the provision of cutting-edge life science technology products and services for research and development.